It is important to note that virtually no service in the Binary Options Brokers category will be a perfect solution that can meet all the requirements of different investors. It may be a good idea to read a few SuperOptions reviews first as some solutions might actually perform well exclusively in a specific geography or situation or be designed with a really specific customer in mind. Others may operate with an idea of being easy and intuitive and consequently lack complicated functionalities welcomed by more experienced users. You can also come across services that support a wide group of users and provide a powerful feature toolbox, however this in most cases comes at a more expensive cost of such a service. Be certain that you're aware of your needs so that you choose a service that offers specifically the functionalities you look for. We realize that when you make a decision to buy Binary Options Brokers it’s important not only to see how experts evaluate it in their reviews, but also to find out if the real people and companies that buy it are actually satisfied with the product. That’s why we’ve created our behavior-based Customer Satisfaction Algorithm™ that gathers customer reviews, comments and SuperOptions reviews across a wide range of social media sites. The data is then presented in an easy to digest form showing how many people had positive and negative experience with SuperOptions. With that information at hand you should be equipped to make an informed buying decision that you won’t regret. 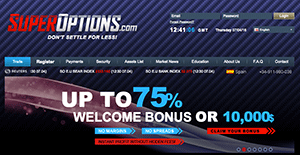 What Bonus Does SuperOptions Offer? - $50-$249: Mini (No bonus until $250 deposit is reached). However, you'll have to execute a minimum trading volume of 30 times your initial bonus before you are allowed to withdraw the funds. SuperOptions.com states on its website that it secures traders’ account funds and privacy at all times. Your deposit funds are placed in segregated bank accounts. Traders’ private data are stored on a dedicated hacker-proof server with 24/7 monitoring. Their account login details are encrypted and secured by SSL and are not shared with third parties. Plus, members’ withdrawals are double verified for identity. All these points show SuperOptions.com strives to be a reliable broker.